A stay at Hotel Palacio de Los Salcedo places you in the heart of Baeza, steps from Torre de los Aliatares and 3 minutes by foot from Baeza Town Hall. This 4-star hotel is 0.4 mi (0.6 km) from Convento de San Francisco and 0.5 mi (0.7 km) from Fuente de Santa Maria. Make yourself at home in one of the 30 individually decorated guestrooms, featuring minibars and plasma televisions. Rooms have private balconies. Complimentary wireless Internet access keeps you connected, and satellite programming is available for your entertainment. Private bathrooms with shower/tub combinations feature deep soaking bathtubs and designer toiletries. Take advantage of recreation opportunities such as bicycles to rent, or other amenities including complimentary wireless Internet access and concierge services. Additional features at this hotel include shopping on site and a fireplace in the lobby. At Hotel Palacio de Los Salcedo, enjoy a satisfying meal at the restaurant. Buffet breakfasts are available daily from 8:30 AM to 11:30 AM for a fee. 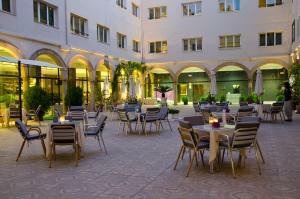 When would you like to stay at Hotel Palacio de Los Salcedo ? Each day we'll check prices and send you an email for your selected dates at Hotel Palacio de Los Salcedo. If you don't have specific dates but would like to check prices for say next weekend or say next month we can check the price too. Click to write a review and share your experience of Hotel Palacio de Los Salcedo with other travellers.